There are many birth control options available today to allow individuals to choose the type that best fits their lifestyle and budget. This visual chart, which is part of our Choices and Chances pamphlet shows the relative effectiveness of each method, and may be a good starting point for someone trying to determine which method is right for them. 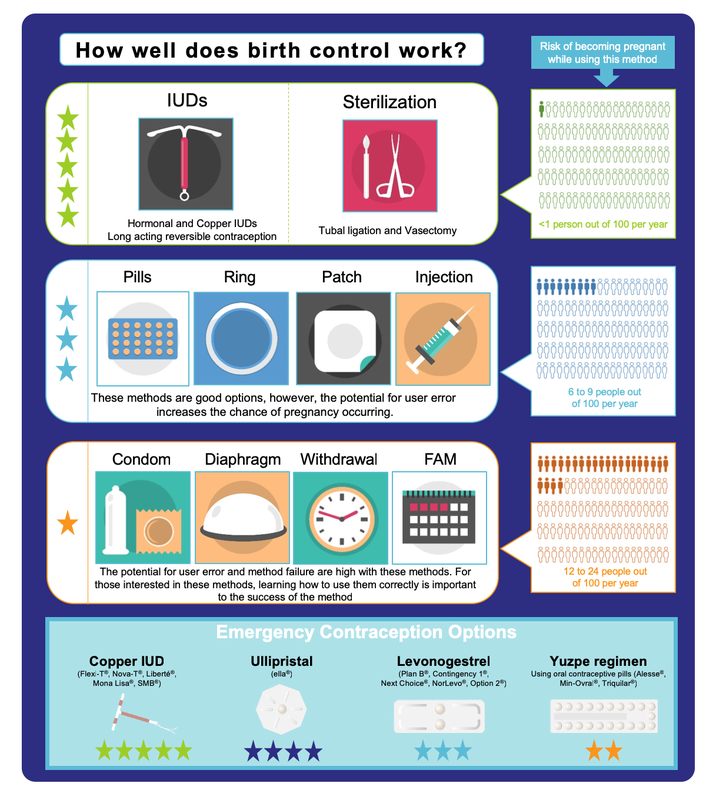 For more information on birth control, visit the Birth Control Methods page. When Canada celebrated its Centennial in 1967 the only legal methods of birth control here were abstinence and the “rhythm” method. Condoms could be marketed only for the prevention of disease. People could be—and were—prosecuted for trying to teach or provide other methods of preventing pregnancies. Terminating a pregnancy was also illegal, resulting in tragic and avoidable injury and death at the hands of “back alley” abortion providers or through incredibly dangerous self-administered methods. Change began in 1969 with the legalization of contraception and the introduction of the birth control pill. In the 1970s the federal government removed the last legal constraints on access to abortion. Today we have access to a wide variety of safe, affordable and effective birth control options. While not fully protected under law, women, trans men, and non-binary folx with a uterus in Canada have the right to choose to terminate a pregnancy as part of the full range of reproductive choices they consider appropriate for them. Some groups in society continue to oppose both contraception and abortion, so all of us who support reproductive rights with regard to reproductive choice need to be vigilant in resisting any effort to restrict or eliminate those rights. Have a question about sexual health?